KENT, Ohio (AP) — Sebastian Douglas made all five of his field goal attempts, and hit 4 of 5 free throws, for 14 points, to give Cleveland State a 78-70 victory over Kent State Saturday night. Bryn Forbes also had 14 points with five assists. Anton Grady and Trey Lewis each added 12. 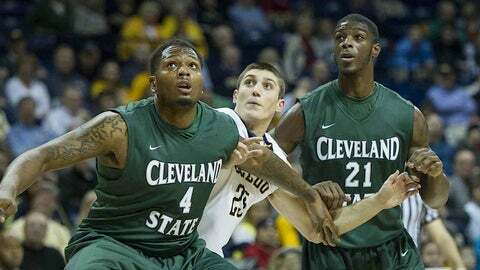 Cleveland State (8-6) led most of the first half and held a 30-28 advantage at the half. Kent State (9-3) came back lead 40-39 with 14:55 remaining. Douglas then made a layup to retake the lead. The Golden Flashes tied the score at 50 at the 10:18 mark, but free throws by Marlin Mason and Jon Harris and a layup by Douglas gave Cleveland State a 58-51 lead. Kent State cut the lead to 66-63 with 3:02 remaining, but a Lewis 3-pointer gave the Vikings a 69-63 lead at 2:39. Derek Jackson led Kent State with 18 points.